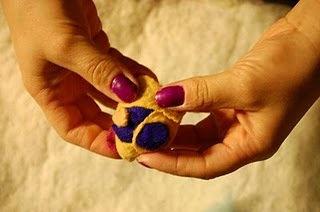 How to make a wool felted ball, by Stephanie of Elemental Handcrafts. *Please note that not all sheep are treated nicely. If you buy wool to make this craft or anything else, please research your source. Some sheep people are only in it for the money and don’t take proper care of the animals in their flock or treat them nicely and humanely. Buy wool with good karma! Locally raised on a small farm is often best. This craft makes good use of old fabric scraps. 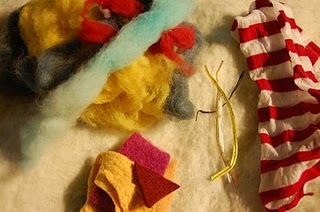 I like to use scraps of old wool sweaters that have been cut up for different projects. Start by balling up your scraps into a tight ball. The tighter the better as this will give your ball some weight. 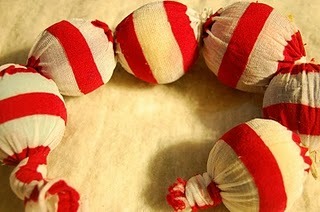 Take strips of wool roving and begin wrapping your fabric scraps until you have well covered them. Keep in mind the color you use first won’t show much, so this is a good place to use a color you have but don’t love. 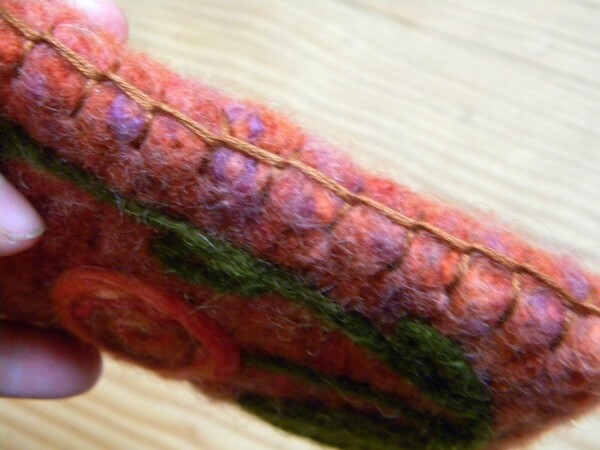 As you wrap your roving, carefully spread the edges out. 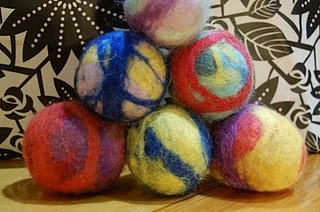 This will help with the felting process, giving your ball a more smooth appearance. 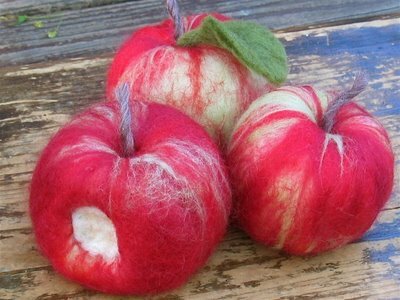 Once you have your ball to the approximate size you would like it, (keep in mind it will shrink a little during felting), finish it off with some strips of color, if you desire. Once you like the look, carefully put your hand into the hose- (I’ve used some stripey Halloween tights that had a hole in the knee), and like a glove, carefully grab the ball so the inside of the tights is next to the ball. Flip the tights over so the ball is now inside and either tie, or twist-tie both ends. Keep doing this until you have all of your balls wrapped in the tights. I like to do as many as I can at a time so we don’t run the washing machine for just one ball. Once your tights are full, toss then into the washing machine with a little detergent and either a towel or some sheets or something without any hard edges. Wash your daughter’s overalls with the metal clips in another laundry load. Don’t add too much laundry. You want something to help agitate the balls, but if you add too much you won’t get enough agitation. 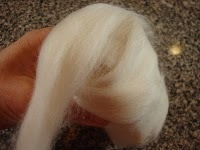 If you are using dyed wool, don’t wash it with anything light as the dyes may run! Run your washer with hot water and use a little laundry soap. No fabric softener! Once it has finished the wash cycle, untwist your ties, take out your balls and reshape them. 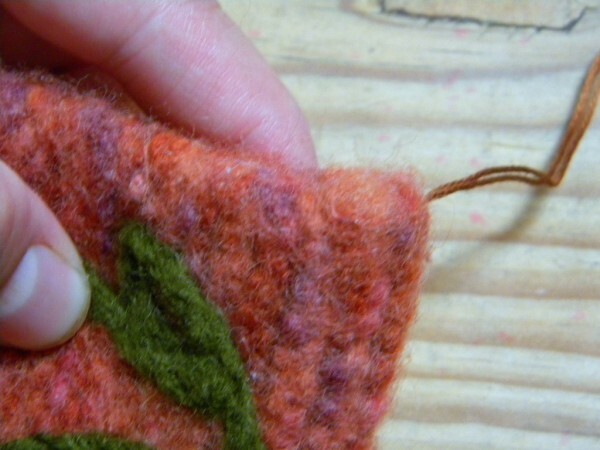 The wool should be well felted and you shouldn’t be able to pull fibers off very easily. If you can pull fibers off, wash them again. 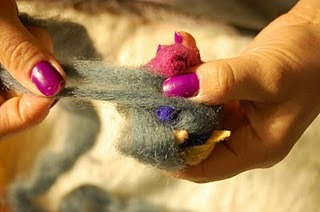 Once felted, take them all out of the stockings and either air dry, or toss into the dryer on hot for more felting. You’re done! If you made six, like me, you can now give them to your kids and look up, “How to juggle” online. Have fun! 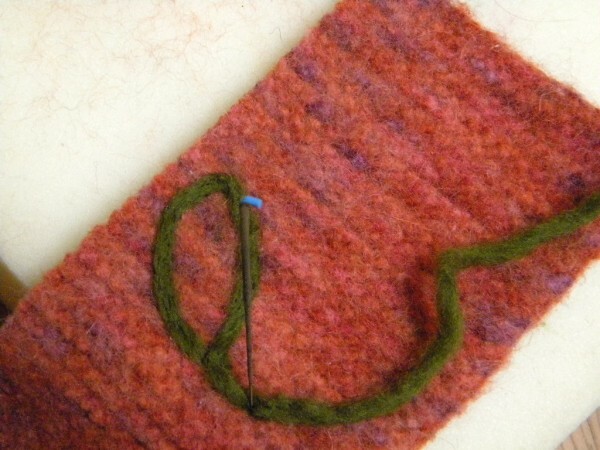 This tutorial was written by Stephanie of Elemental Handcrafts. This is an activity that is easy to do with young kids, though they might get a tiny bit wet! These would be cute gifts to make for grandparents. 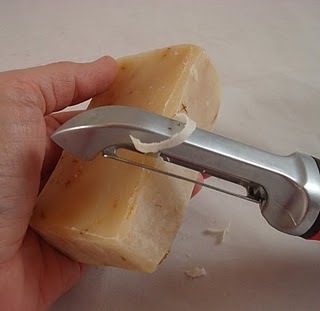 If your soap is rectangular, first take a vegetable peeler and to round the edges a bit. This will make it easier to cover the soap bar completely without any corners peeking out. Now you can begin wrapping the bar of soap with wool. I usually start with a base layer of plain white fiber, though any color is fine. 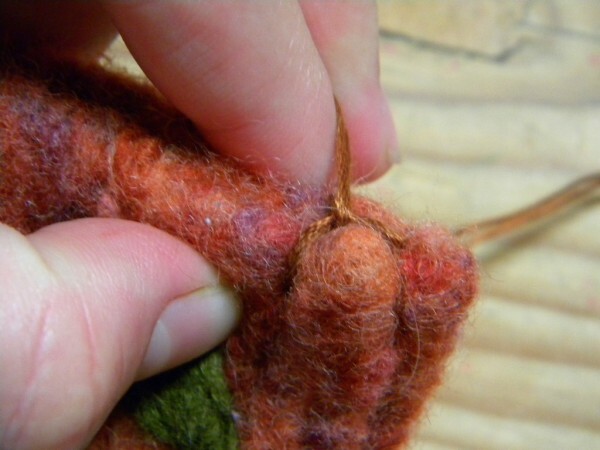 Pull off pieces of wool roving that are about one inch thick and two feet long to make this easier. Try to wrap tightly without twisting the fibers to help keep the surface as smooth as possible. Once you have wrapped the soap going in one direction (vertically), flip it to the side and wrap it in the opposite direction (horizontally). Now wrap it vertically again, make sure to cover the narrow sides too. This makes for three layers so far and should be good enough for the base layer. The fun part is adding your design layer. Layer on any colors you want and any direction-just try to keep the layers as smooth as possible. 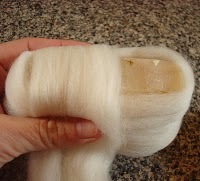 Here you can see just how much bigger the wrapped soap looks before it is felted. It will have shrunk quite a bit when you are done. 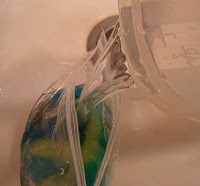 Carefully place the wrapped soap inside a ziploc bag. 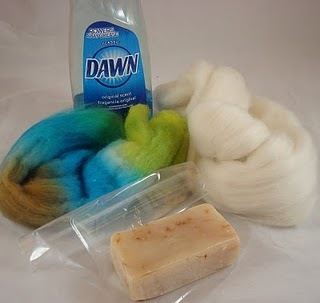 Add some dish soap to a few cups of warm water and pour some water into the bag to fully wet the wool. Let the excess water run out and seal the bag closed. With the bag on the counter, gently rub your hand back and forth over the surface, turning to get all sides of the wrapped soap. Then gently toss the bag bag and for between your two hands, left to right, right to left for about 20 tosses. 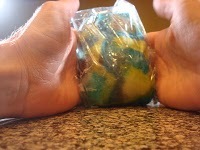 Open the bag, and add more hot soapy water, let the extra drain and seal it again. Now begin to roll the bagged soap in your hands, like you do with a regular bar of soap when washing your hands. Change directions frequently, roll the soap lengthwise. Do this for a few minutes. The wool should be starting to shrink now. Remove the soap from the bag and do the pinch test. Does the top layer of fibers lift up, or does it seem attached to the base as one layer? If the fibers lift up you need to work a little bit more. You can put the soap back in the bag with more hot soapy water, or you can suds up your hands and roll it around in all directions. Surface friction is the goal. For wool to wet felt it needs friction, and hot soapy water. When the felt passes the pinch test, rinse it as best as you can with cold water, You will never get all of the soap out, as by this point the bar of soap will have started to suds up inside the wool. 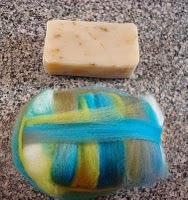 Roll the felted soap inside a towel to get as much water out as possible and dry on a rack. 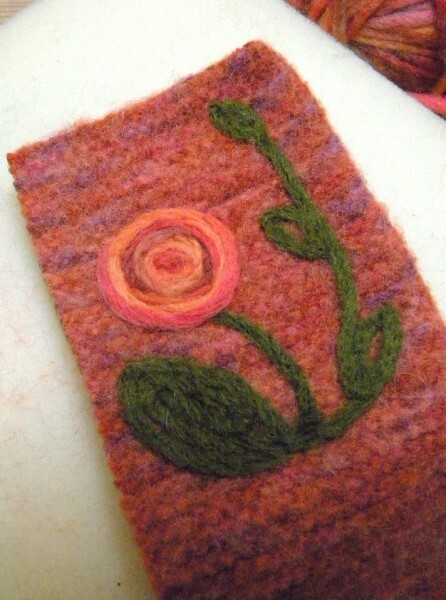 If you want to make something fancier you can try needle felting a design on some layers of loose wool. 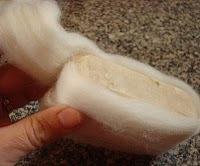 Lay this design over the base layer of the soap, wrapping the edges of the wool to the back before felting. The name “Alkelda” is Old English for “healing spring.” Alkelda is an apocryphal saint, and her feast day is my birthday. 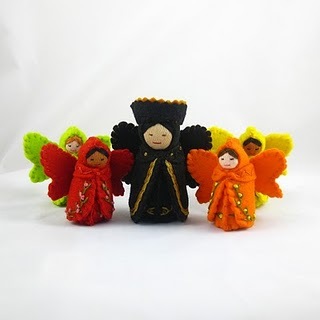 When I decided to become a seller on Etsy, I elected to keep my username as my shop name and added “Dolls for Storytelling” to make it clearer what the shop offered. 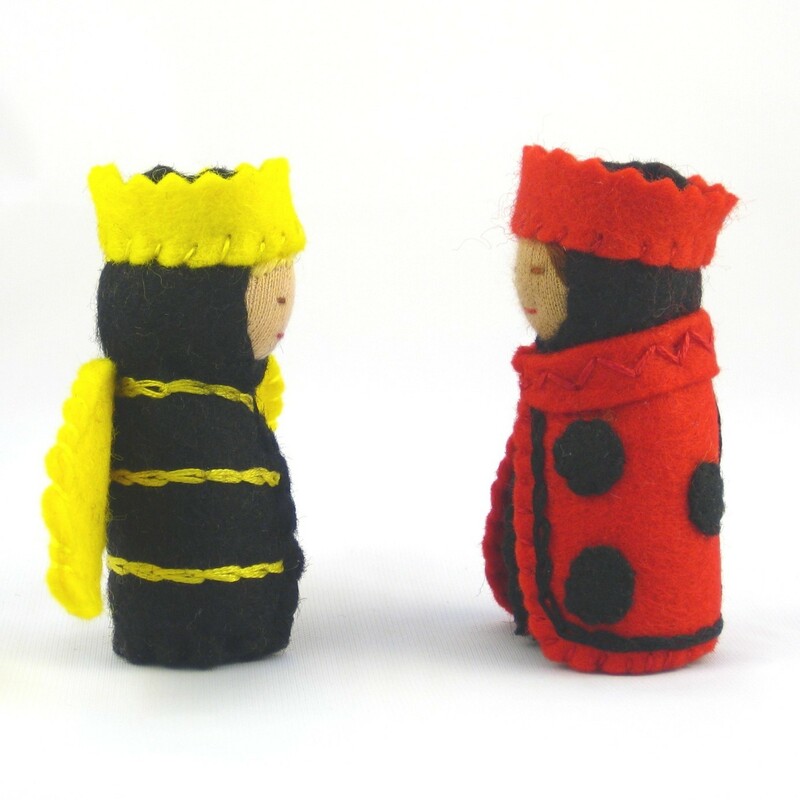 I make embroidered wool felt dolls for storytelling through creative play. 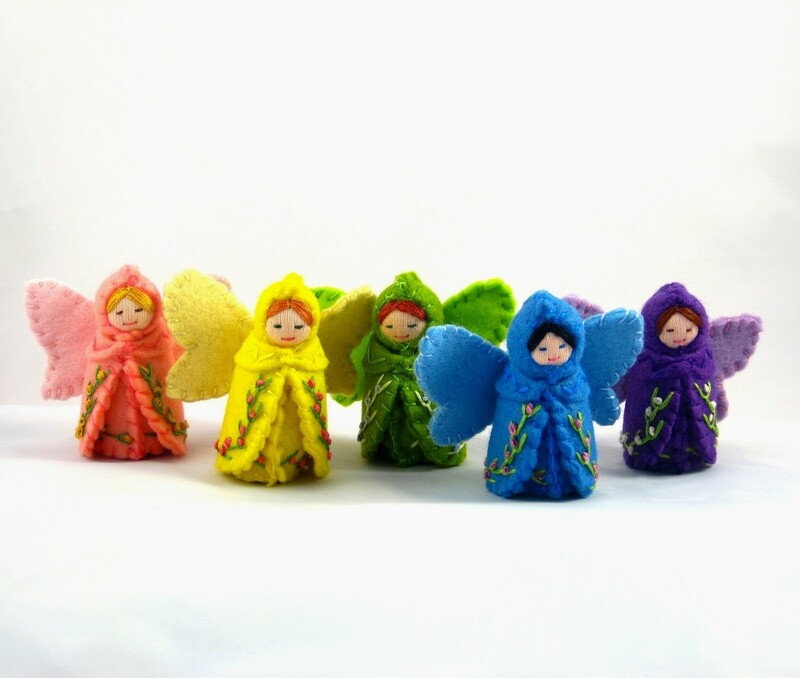 As a teenager, I would hand-stitch small dolls out of fabric remnants to give to family and friends, but it never occurred to me to seek out specific fabrics until I started making the little felt standing dolls like the ones in the shop. 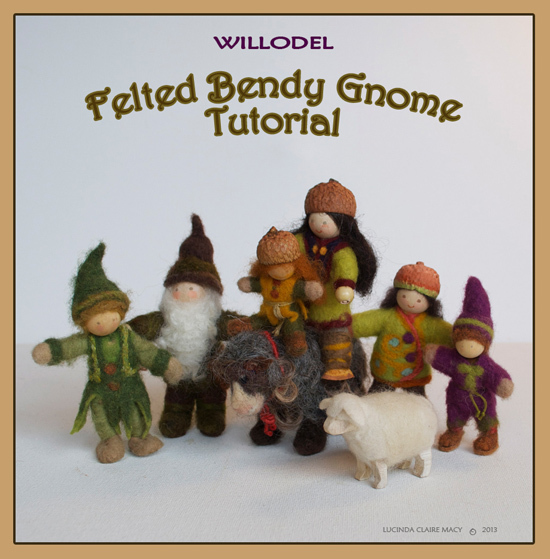 I started out with doll-making kits, and then developed my own patterns. I learned to embroider as an adult with the help of several embroidery books. I am inspired by plants, the curriculum in Waldorf schools, folktales, music (some of my dolls carry felt guitars), ironwork scrolls, and embroidered tapestries. My daughter loves dolls, and she often comes up with ideas for me, as do friends and family members. A few years ago, I read her Sibyl Von Olfers’s The Story of the Root Children. She enjoyed it, but asked, “Why are all the root children blonde?” I explained to her that the author was Prussian, and she probably knew a lot of blond children, but that the majority of the Earth’s population has brown hair. 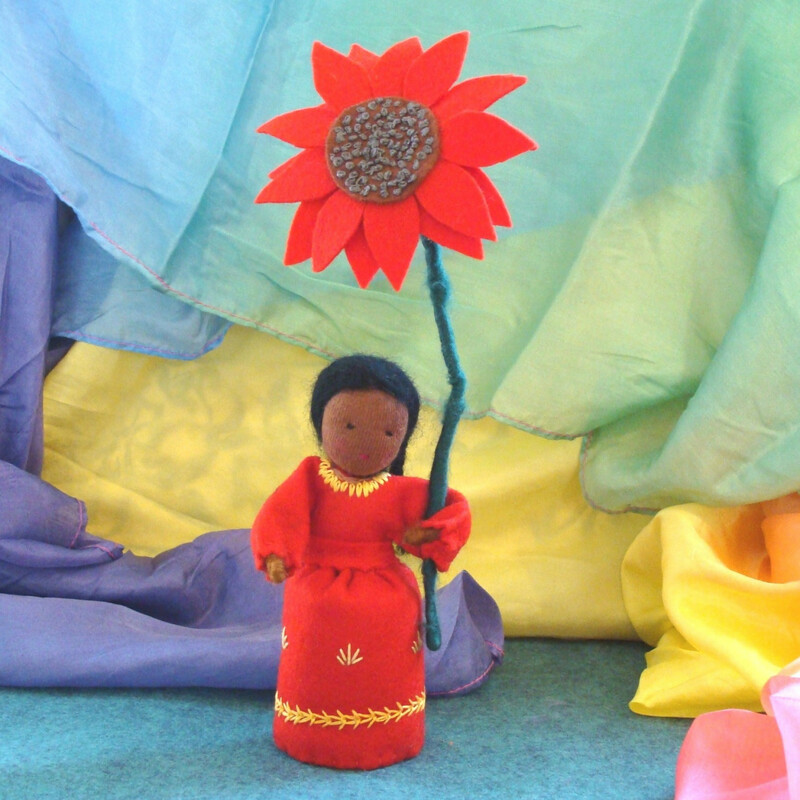 When I talked about this conversation on my Saints and Spinners storytelling blog, friends of mine wrote about how they had longed for depictions of fairies and fairy-like dolls with dark hair and skin, and how rare it was to find them. 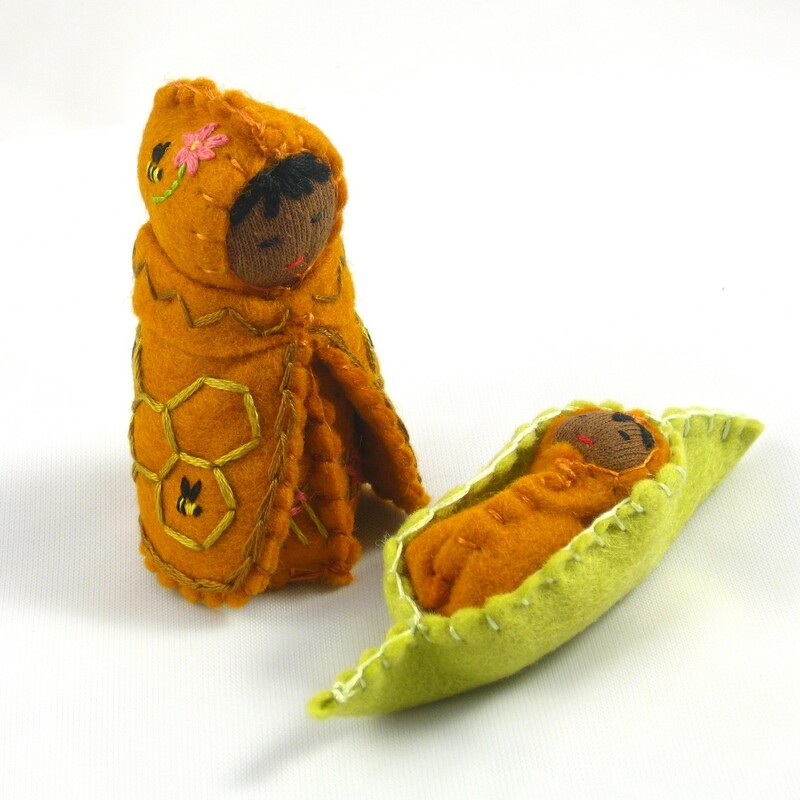 Many of the dolls I make are for my friends when they were children as well as the people who are children now. I am glad that I can find cotton interlock for faces in a variety of skin tones. I started out as a buyer in June 2008 and became a seller in May 2009. When I started, I had no intention of starting a cottage industry business. However, when I started to make little dolls and people asked for commissioned work, it occurred to me that there might be a tucked-away corner of the market that would have room for my virtual stall. I was fortunate to have an online community already established for four years through my storytelling blog, and friends were willing to mention my new shop. Still, I was bowled over the first time I received an order from a stranger. I was glad to be able to join the Natural Kids Team because I liked the artisans and wanted a sense of connection with others who liked to create things that appealed to children. that when I have a question, people on the Natural Kids Team have perspective and can give guidance. 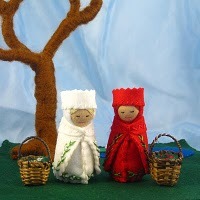 As an adult with experience, I prefer to give my daughter toys made out of wool, cotton, wood and clay. These natural materials are warm and living. When minimally formed, these toys allow for many layers of creative play. However, I can understand the attraction of battery-powered toys. Before my daughter was born, I bought a little fire-engine train that had a battery for the siren. I got a kick out of pushing the button every once in awhile to hear that siren. However, when my daughter received the fire engine as a present, she pushed the button repeatedly. When she wasn’t looking, I took the battery out, and then gave her back the fire-engine train. She pushed the button and looked at it quizzically when it made no sound. After a few moments, she set the fire engine train down on the track and said, “Chook-ca-chook-ca-chook” (her train sound). I realized that by taking the battery out, I was giving her imagination room for its own discovery. Spring brings new babies throughout nature, and the magical, enchanting process of watching wee ones hatch from eggs. There’s a turtle sanctuary on an island near where we live, and my daughter loves discovering the beautiful white eggshells left behind. 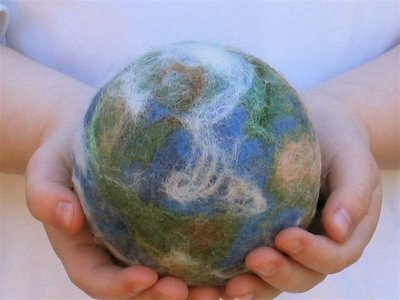 Here’s how to make a wet felted, rainbow wool egg for gentle play, your nature table and even spring celebrations like Easter and Passover. My daughter says the most enjoyable part of the process is actually choosing the colors for her egg. Next take your egg shape (we use a small-sized one for the kid projects) and wrap wool roving around it, placing narrow pieces of wool in different directions, wrapping it neither super tighthly, nor super loosely. 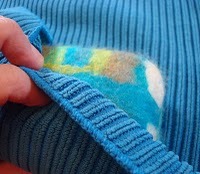 It’s far from an exact science, and the felting process will make the apparent “messiness” of the wrapping disappear. 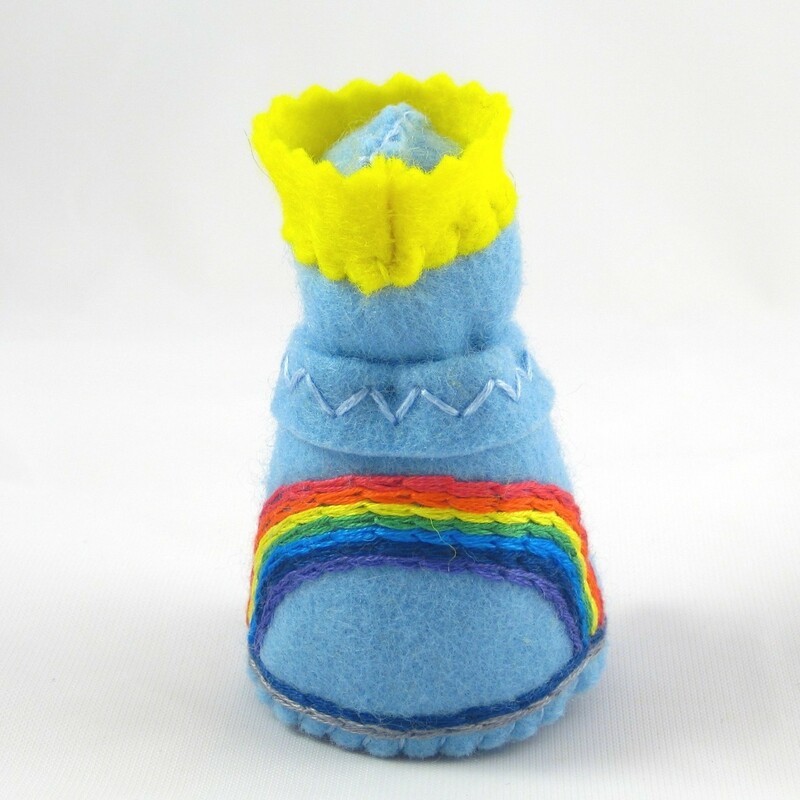 The thicker the wool coat on the egg, the thicker and sturdier your final rainbow egg will be. 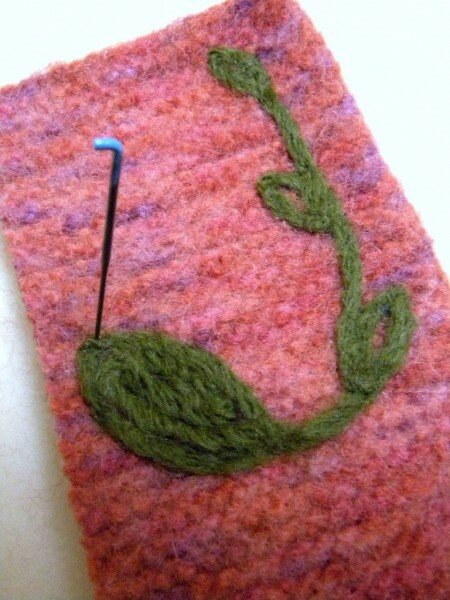 You should not be able see the egg clearly through the wool (that would mean it’s best to add more wool). Now hold the wrapped egg in one hand, and have your child (or your other hand) pour some liquid soap right onto it, turning the egg as the soap is applied. I’ve found this to be an easier method to felt the eggs. 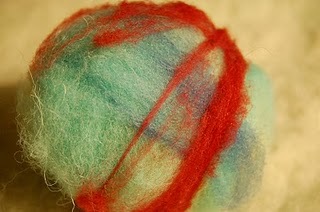 I have yet to use too much soap in felting! Now quickly immerse the egg in hot, hot water. Gently squeeze the soap egg, turning it in your hands (or your child’s hands). Keep the wooly coat on the egg warm by dipping it into the hot water every so often (the warm/hot water relaxes the fibres of the wool which allows for easier felting). 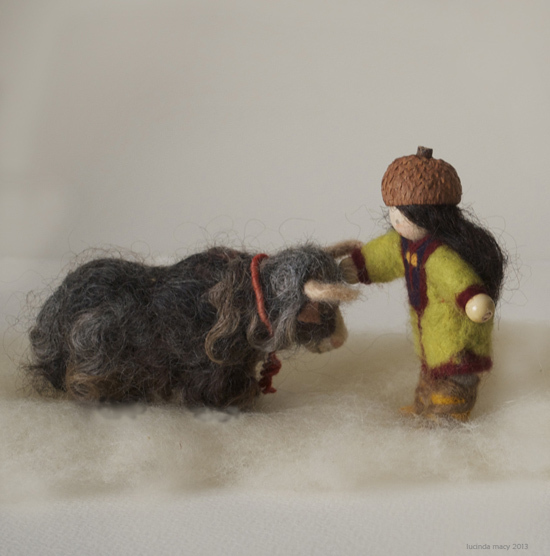 Keep gently squeezing and patting the wool, and as you work and the wool begins to felt you can work it more vigorously. This process take a little bit of time, but the results are well worth it! 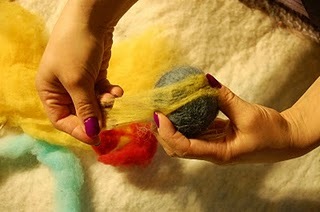 Once you begin to feel the fibres felting around the egg, and solidifying somewhat, it’s time to add the “rainbow”. 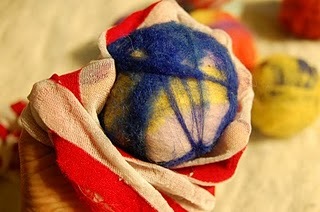 Your child can gently rip off small pieces of colored wool, and place them onto the egg in varying directions. The wispier and more spread out the wool bits, the better (the more easily they will felt to the woolen egg). Then pour some soap onto the egg, immerse gently in hot water, and gently squeeze the soapy egg to help felt the rainbow wisps together to the wool roving. Keep squeezing and rubbing it vigorously in your hands. 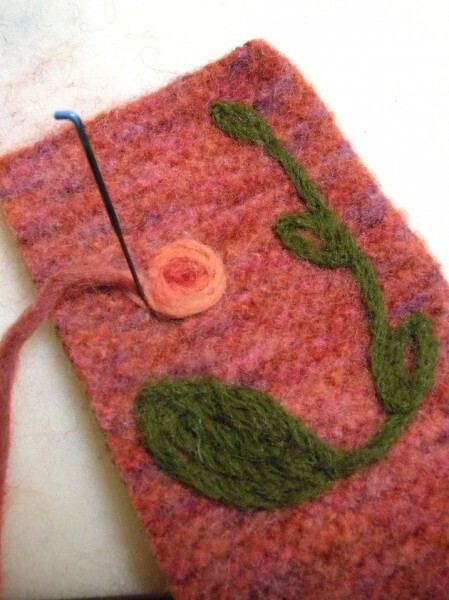 You can also use something with texture to help felt the fibers of the wool. I use an old wire rack for this, and roll the egg around on the rack for a few minutes. Then I take it back into my hands, warming up the wool in hot water, and squeeze it some more. 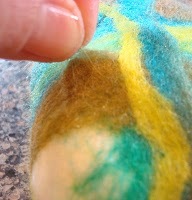 Once you’re done, you can dip it into cold water to help strengthen the felting. The shock of the cold water tightens the fibres. I wrap the egg in a dishcloth to remove some excess water, and place it near a vent to dry. Once it’s dry (anywhere from a few hours to a day or so), you or your child can carefully cut the egg open, either in a straight line across the long part of the egg, or a cracked jagged line. The cut need not extend the length of the egg, just enough to “birth” the egg from it’s woolen coat, so to speak. 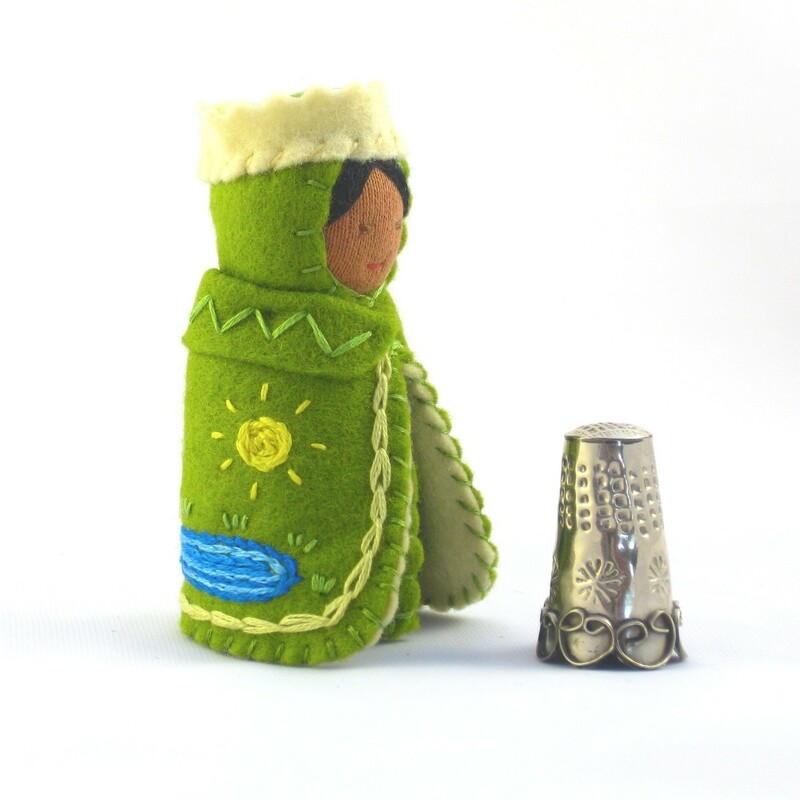 You can find more how-to’s and eco living articles on our blog, the SewnNaturalstudio. My name is Lynne and I’m a stay-at-home Mommy to two little girls, ages almost-8 and almost-6. I have always gravitated towards anything that involves creating something new. I love making stuff! Like a lot of people here on Etsy and on the team, it was my kids who led me toward doing what I’m doing now. 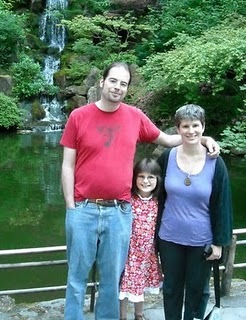 My business really began when my oldest was 3 and I enrolled in the parent-tot program at a nearby Waldorf School. A few weeks into the session the teacher passed out yarn and knitting needles to all of the mothers. She told us that with our knitting, we would be doing our work while our children did their work, which was to play. I fell in love with Waldorf Education right then and there. 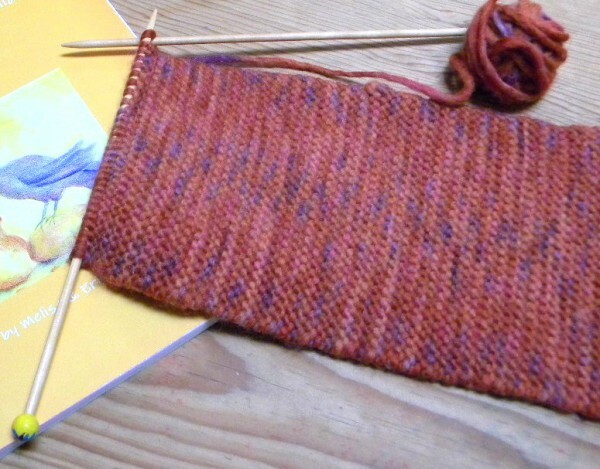 I had learned to knit at some point in my childhood and I was so thrilled to be picking it up again. When I finished my knitting project – a little kitty cat – I couldn’t wait to make other. Pretty soon I had two families of four cats (which, five years later, my girls still play with) and was looking for what else I could make. It didn’t take long to realize I wanted to create a business making things for children. 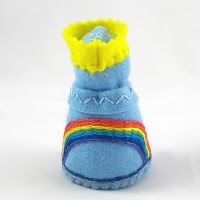 I make items for children and their families out of wool. 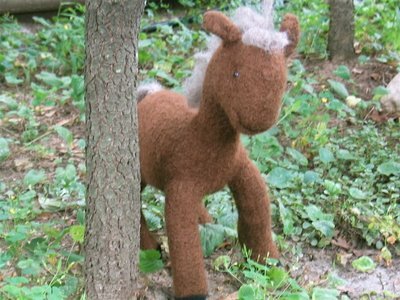 All of my items are felted using various techniques. 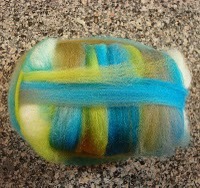 My knitting led me to try felting what I had knit. 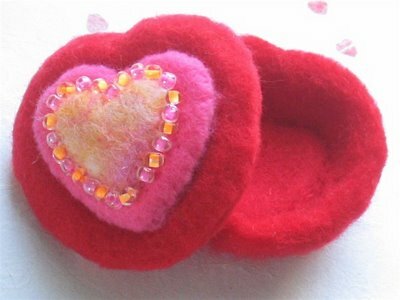 That inspired me to embellish my items with needle felted designs. 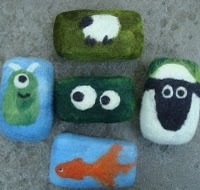 From there I began making needle-felted sculptured pieces. 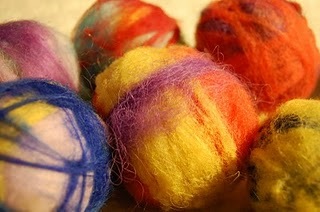 And eventually I delved into the exciting process of wet felting. Basically it’s been one big experiment followed by another big experiment. I have found that the more I explore what wool can do, the more there is to explore! I like to try new techniques and create products I think a naturally-minded family would want for their home and for their children. No one person in particular. I feel very inspired by the work of my fellow teammates. Being on the NaturalKids Team makes me always want to do my best work. Also, I seem to be following in my grandmother’s (my mother’s mother) footsteps. She was incredibly creative and was always making something. 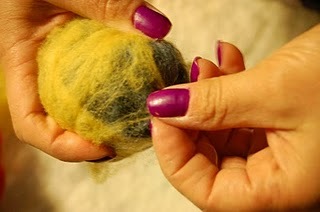 One of the first times I had my mother to my house after I had felted something, I apologized for the wet-wool smell. 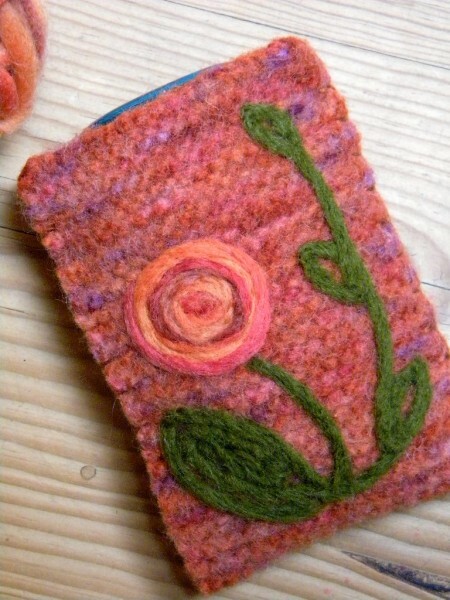 She said, “Oh, I don’t mind it – it reminds me of when my mother used to make hooked rugs out of boiled wool”. I never knew my grandmother had done that. Mainly from nature, and also from the desire to create a home filled with natural goodness. I remember as a child going to my grandparents (my father’s parents) house. My father would refer to this house as “the museum” because it was filled with treasures no one was allowed to touch. As much as I loved my grandparents, I’m wanting to give my kids more of a “hands on” childhood. And I feel it’s important to honor and nurture their spirits with products that are from or reflect the natural world. Wool – I’m obsessed with it. To me it’s a magical material. It can transform into anything you want. It’s so important to me for my girls to know that from this pile of wool, anything can arise as long as you have the vision and patience to bring it to life. Well, basically to go for it. When I first started I had no idea where it would lead me. I had no idea if I’d have any sales. 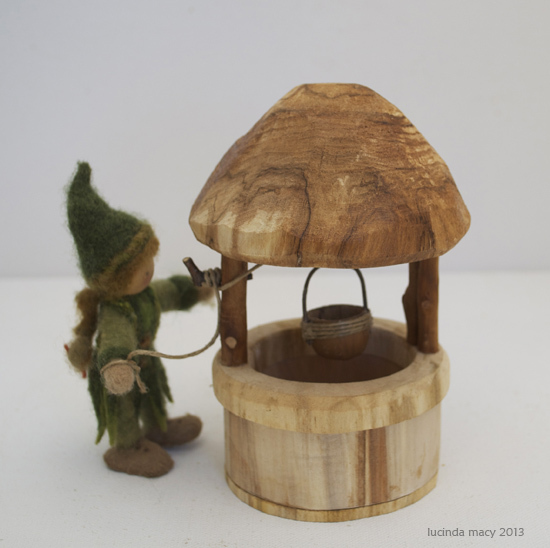 Now I have a bona fide business and a wonderful camaraderie with like-minded artisans. The experience has been ten-fold what I was looking for. And with that in mind, it does take work. You get out as much as you put in. You can’t expect to open up a shop and be carried along by Etsy. It’s very true here that the more you contribute, the more you get back. Experiment with your materials as much as you can. If you have something in mind you’d like to make, you’ll get there if you allow yourself some mistakes and to learn from them. http://cozycottagecreations.etsy.com. You can find me here on Etsy! Thanks for reading my interview!